HONOLULU (AP) — Hurricane Lane weakened to a tropical storm on Friday as it headed toward the Hawaiian islands. But it still brought torrential rains that immersed a city in waist-deep water and forced people to flee flooding homes, while others jumped off seawalls with boogie boards into the turbulent ocean. As many dealt with flooding and even brush fires, swimmers and surfers ignored warnings from authorities and plunged into powerful waves at Oahu’s famed Waikiki Beach, which was closed. Emergency officials said repeatedly over loudspeakers: “Please get out of the water! It’s very dangerous!” Honolulu’s mayor pleaded with tourists that they were putting themselves in danger as the storm churned closer. The gushing water knocked down a cement wall and lifted her truck out of the carport, sending it toward her neighbor’s house, she said. “My house is completely inundated with mudwater,” said Collins, who was told the damage wouldn’t be covered by insurance. She hopes she can get federal assistance. A different type of evacuation took place on Oahu — the state’s most populated island. 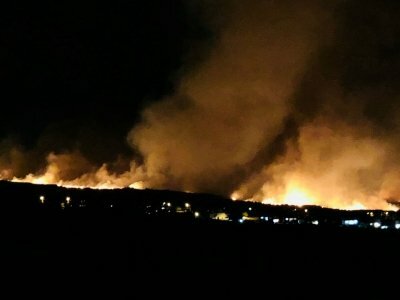 Some residents in a shelter on Maui had to flee when a fire got too close and another forced people from their homes. A woman got burns on her hands and legs and was flown to Honolulu, Maui County spokesman Rod Antone said. Her condition wasn’t clear. “The canal has flooded in the past, and I believe it’s safe to say based on the forecast of rainfall it’s likely to flood again — the impacts of which we aren’t prepared to say at this time,” Alexander said. Employees have filled sandbags to protect oceanfront hotels from surging surf. Stores along Waikiki’s glitzy Kalakaua Avenue stacked sandbags along the bottom of their glass windows to prepare for flash flooding, while residents lined up at stores to stockpile supplies. Away from the high-rise hotels of Waikiki, Crystal Bowden, a tourist from California, watched powerful waves crash against cliffs on Oahu’s southeast coast. Associated Press writers Brian Skoloff and Caleb Jones in Honolulu, Mark Thiessen and Dan Joling in Anchorage, Alaska, Colleen Long in Washington and Alina Hartounian and Annika Wolters in Phoenix contributed to this report.